Successfully Added Perfect Office Mate- USB Flash Pen with Laser -4GB to your Shopping Cart. 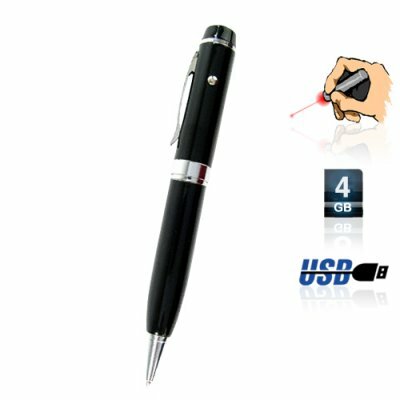 New 4 GB USB flash drive pen with laser that makes a great gift for any business man or woman. Excellent for presentations and storing work files along with personal files in between home and the office. It also works as a very classy, smooth writing pen. This USB drive comes in a fashionable pen style that you can proudly carry every day. With its hidden USB storage function, this USB pen can be your secret best friend. Store all the documents and files you need on its huge 4GB's of memory and never worry about being short of storage space because 4 gigabytes will store literally thousands of office and digital media files. This 3-in-1 innovative gadget works great for any salesperson who makes a lot of presentations and does not want to carry many separate devices. What's the point of carrying around a separate laser pointer when you can have one that does three common tasks with high performance and style; (1) USB flash drive, (2) writing pen, (3) laser pointer. Make work and life a lot better with this 3-in-1 cool 4GB USB flash pen drive with laser. This exclusive "Perfect Office Mate Edition" is a nice personal tool and should help in signing those million dollar contracts with class! What happens if the pen runs out of ink? The ink comes in a standard cartridge type that can be easily found in your local stationary supply store. Is the laser safe to use? Yes. However you should not point it directly into anyone eyes.